Michael Houston joined Grey as CMO in 2007 and became CEO last August. He is one of the youngest leaders in the business and believes strongly that advertising needs to become more diverse in order to produce work that is representative of society. For him, that means a lot more than promoting more women to senior positions. In this exclusive interview, Houston discusses how he thinks advertising should evolve, the pros and cons of awards shows, Japan, and what Grey has done to foster a more open-minded working environment. What do you consider to be the impact of Sir Martin Sorrell’s resignation from WPP—for Grey, for you personally and for the wider industry? I’m extremely saddened by the news and disappointed because I was looking forward to many more years of working with him. I’ve found him to be provocative in a good way. For Grey, WPP is made up of 200,000 people, and I think we’ll all continue to stay focused on serving our clients and people, so on a day-to-day basis I don’t see any massive change. For the industry, I think it’s unfortunate, because he supported and pushed the industry agenda. So regardless of what the impact may or may not be for WPP, losing his voice in the industry is unfortunate. Any time any industry loses someone with that amount of passion I think it’s a shame. The industry seems to be moving towards greater consolidation. What do you think of this direction, and of Sorrell’s suggestion that clients don’t care about individual agency brands? I don’t believe it’s possible to generalise for all clients, so I don’t agree with that statement. But there are some that are less interested in agency brands. I think our industry is extremely guilty of navel gazing and believing what’s happening to us is wildly important to clients. I think what clients are focused on is driving success in their own organisations, and that’s what we should be focused on—less on internal mechanics. I’m a big believer in constant evolution and I think change usually proves to be a very good thing in most industries, so I’m open to change and to different types of collaboration. Sorrell was a big picture thinker. With him gone, does the industry risk becoming more inward-looking? I don’t know if the industry could become any more inwardly focused [than it already is], but I think there will be pockets that become more obsessed with what’s happening to agencies themselves. The organisations that succeed will be those that stay focused on delivering results for clients. To do that we need to have a macro view of what’s happening in the world—understand what’s happening beyond advertising, solve business problems and not marketing communications problems. How can agencies make things simpler for clients? I’m not sure if this will be a popular point of view but I don’t think agencies are overly complicated. There is more complexity at client organisations and much of what they point to is complexity they’ve created by bringing in too many partners and slicing up the pie into too-fine pieces. So one way we can help them simplify is demonstrate how we can provide a deeper level of service for them and continue to choreograph or orchestrate many of the marketing functions as a single or smaller group of agencies. So to say it again, I don’t think agencies are complex, but the way clients are working with them is. It’s not that I’m not hearing clients and not that I don’t feel their pain, but I don’t always fully understand what complexity they’re pointing to other than having too many people at the table fighting for the same thing, and not a more single-minded stealth team focused on achieving a singular result. Volkswagen has talked of a setup where various disciplines work together in five global hubs. Is this the way of the future? I don’t want to sound contradictory on the point about the number of agencies clients have built up, but I do believe collaboration is the way of the future. I think [for VW] this could very well be a great solution as long as there’s clarity around the rules of engagement, responsibility and decision-making power. Those are the types of things that if left unanswered lead to complexity and failure. Is there enough collaboration at the moment? I think the closer all those disciplines can get to one another the stronger the work is going to be and therefore the greater impact the work will have in the marketplace. I think the easiest way to look at marketing communications is to look at consumers and how they’re living their lives. We’ve created an industry that’s bifurcated disciplines and that’s not how people live, so if we can create structures that mirror the way that consumers interact with brands and products, the more successful we will be. Let’s talk about the creative product. What is your position on ‘proactive’ campaigns—are they justifiable? We’re not interested in creating fame for fame’s sake. We’re interested in tapping into pop culture so we can achieve results for clients. So work that may be seen as creatively inspiring but lacking results is not the type of work I’m interested in producing and everyone in the organisation knows that… If we are able to demonstrate the real power of creativity to clients we won’t find ourselves having to create fake work to demonstrate how we think. Do clients care about awards? I think very few are interested in chasing awards, however I don’t know of very many clients who are unhappy to receive them… The issue happens when the client feels the agency is pushing work for the agency’s agenda versus the client’s agenda. Is Cannes doing the right thing in changing its format? If I were to look into my crystal ball I would say there are positive changes coming to Cannes. Over the past few years it felt that it had lost focus a little bit and I think this is an opportunity to retrench and clarify what the festival is meant to be about. It’s meant to be about creativity that makes a difference in the business world. Where it went off the rails was in becoming a bit too pure on creativity to the extent that it was becoming an artistic festival more than a business one. What do you think of the work being produced in Japan at the moment? I spoke with our entire agency [in Tokyo] about creativity at large. And afterwards a young creative asked, thinking about Cannes and creative awards events, how Japanese advertising can break into the Lions and other key global awards. He felt given the size of the economy, Japan is underrepresented in global awards. I found that to be an interesting dilemma, so the first thing I did was turn the question around and said, is the real task breaking into awards, or is it helping them to evolve and appreciate different kinds of creativity? One thing we need to do as an industry is open our minds a bit more and understand that one group’s definition of creativity can’t be the only definition. So I asked the team to get more involved in the conversation and on the global stage in defining and creating the parameters of creativity. Watching Japanese TV, you are likely to see a lot of ads where a dance routine is the central concept. Does the day-to-day work strike you as somewhat formulaic? It has occurred to me but I think the Japanese market is showing signs of openness to and interest in different approaches to advertising and marketing. From what I’ve seen and experienced, certainly the younger generation is open-minded to different ways of expressing ideas, so I would think the creative product has a pretty healthy runway in Japan. How do you define diversity? In Japan, it tends to mean women in the workplace. I think in a lot of places it can mean that, or quotas. In the US, it would most likely mean racial before gender. So I think the word is too loose a term to apply to the many things it needs to cover. For starters it’s a business imperative. We are meant to create some sort of emotional connection in order to drive action, and that requires diversity. I think gender-, racial-, socio-economic-diversity and diversity of thinking are all important and what I ask of our individual markets is to ensure that we are representative of the consumer base to whom we speak. I remember I was in Italy talking about our diversity agenda and someone said, that’s great for the US but here in Italy everyone is Italian, so I don’t know what you want. I said not everyone in Italy is Italian, or thinks the exact same way. There are different genders, religions, socio-economic levels—so find a way to be representative of the communities to which you’re speaking. I think one of the reasons people quickly go to ‘women in the workplace’ is because it's a simple and clear area that needs improvement, and it’s easy to run the numbers on it. Socio-economic diversity is harder to quantify. What has Grey actually done to advance the diversity agenda? We’ve made it clear that offices and office leaders will be measured by their ability to create a more diverse workforce. I think it’s about setting the agenda and setting expectations. It means different things in different markets and so I asked them to come back to us and articulate what diversity should look like in their market. It’s not me sitting in New York and telling them, but ensuring we’re having an active dialogue about it, setting standards and putting processes in places to increase diversity. In New York, we’ve had a number of initiatives. The first is that we created the People’s Council, and that is a number of different groups who’ve come together within the organisation to promote various facets of diversity. They’ve each been charged with writing a charter for their groups and initiatives and once these are approved by management we support them in any way they believe they need support. There was a group that got together and identified the need for people of different socio-economic levels to find a way to break into the ad industry. So we created a curriculum based entirely on scholarship, so young people who don’t have the means to put a portfolio together can now get hands-on training from some of the best people in the industry. Another thing is globally we’ve changed our creative briefs along with the 3 Percent Conference [a diversity-oriented event in the US] and created language led by our global chief creative officer and head of planning so that every brief ensures the work we are briefing into teams will put diversity front of mind and ensure we’re not perpetuating stereotypes. 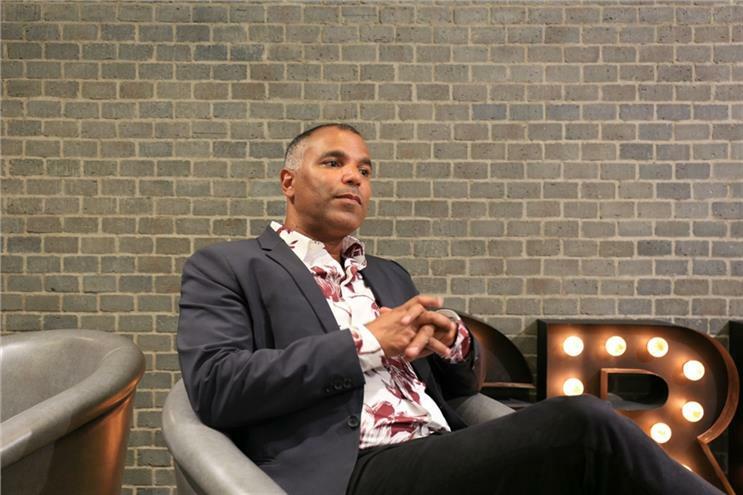 Last year, Rob Reilly [McCann Worldgroup’s global creative chairman] said that in the US, "people of colour don’t feel like advertising is a business for them". Do you agree? I think I would agree with Rob, and yet I’m perplexed as to why that’s the case. Because I look at so many other creative fields that are centred around popular culture and I think black people or other people of colour absolutely find themselves a home in those fields. I think historically advertising, certainly in the US, has been a field that was founded by more privileged Caucasian people so I guess it’s history that’s partially to blame. But I feel we’ve evolved in so many other ways since the Mad Men era that it’s still perplexing. Lastly, how open are you to hiring people from outside the field of advertising? Do you see this as important for the future of the business? If we only hire ‘agency people’ that’ll be the fastest route to our death. We need to actively recruit people from industries that are not advertising but still have a creative sensibility. Also, I think the notion of an idea being owned by only one person or one agency—those times are long gone. A great idea has multiple parents raising it and nurturing it and I think if you accept that there’s a better chance you’ll accept diversity because thinking will come by definition from places you haven’t originated from.